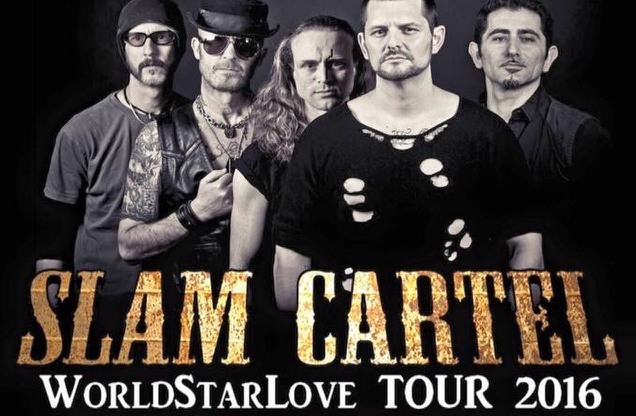 I had chance to catch up with the Slam Cartel boys while on their current WorldStarLoveTour, to have a chat with them about this years festival. So you have added Ashford Festival in The Park to the dates of your present UK Worldstar Love tour. How excited are you for the festival? We are looking forward to the summer even more now – Our WorldStarLove tour has just got even better. Being the headlining act of not only the festival, but the Martin Judd stage, must be a big honour for you all? We are very proud to be playing the Martin Judd Stage it is such an honour it truly is! Martin did a lot for everyone in Ashford’s community; he was supportive but also brutally honest. He finally got to see Slam Cartel play last year. Being on his stage will be a humbling experience, there will be tears! And we are sharing it with Martin’s band, the aptly named Legacy, which is just amazing. Brilliant musicians, great guys, and Gary the new bass player used to be in Slam Cartel, and now manages our website. Headlining is always fun and always raises the adrenaline and I am sure this evening it will be heightened even more so. Martin was like the Yoda of the bass, wise and lovely. It is going to be an immense evening. Martin was a huge part of many lives and his Legacy has lived on in many ways. How do you think Martin would feel about the Friday night being dedicated to him and all he did for the local music scene? Martin would absolutely love it! He’d probably want the stage to be a lot bigger and a huge statue of himself right in the middle of it!! He’d be delighted that the festival had extended to three nights, and he’ll find a way of being there with us all in some way! You can be sure that he will be in our thoughts on the day. We had total respect for him, and he was a good friend to the guys in the band personally. His contribution cannot be overstated, as a gigging musician, organiser and all round good soul. The festival’s ethos is to nurture and promote local performing arts in many forms. How important is it that children are exposed to live, local music and the arts? This is the Festivals 11th year! As a local band do you feel it is important to have this kind of event available to our local community? For sure, keep it going every year! (Whatever the weather), Local music festivals bring the community together and Ashford has a strong music community, it’s great to showcase the local talent. Finally, what can we expect from the Slam Cartel performance at this year’s festival? You can always expect that we will give everything we have to make sure everyone goes home happy. We always do. This year, we’re bringing WorldStarLove with us in abundance. A high loud, high energy, rock’n’roll show, just like Martin would approve of, we can’t wait! We’re playing virtually every song we’ve ever written, we’ve got new boy JC on guitar, who’s also an Ashford resident, and he’s given us a real kick up the arse, we’ve upped our game!! You can expect volume, heart and soul, something to remember, something to take away and hopefully to inspire. A time and space shared. We will rock. You will rock. We shall never, ever forget him. Nothing but WorldStarLove! Visit the band’s website at www.slamcartel.com.